Our product range includes a wide range of foundationless weighbridge. Foundationless Weighbridge is boon to industries like mining, quarries & construction which need to shift the weighbridge from site to site. Conventional weighbridges have heavy rigid platforms and require costly & time-consuming civil foundation. This makes shifting of the weighbridge very expensive as trailers / open truck is required to transport it and again civil foundation has to be built at the new site. Also, the taken took & labor involved in dismantling and re-commissioning is enormous and hence adds to the cost of shifting tremendously. 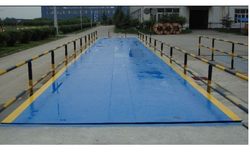 Our unique design of foundationless weighbridge eliminates all the above disadvantages of conventional weighbridge and enables quick shifting at a very low cost. Its modular design makes it easy to transport & civil foundation required is very minimal. The platform sits on a removable frame that, when bolted together, forms a solid base, complete with end walls. No ramps are required. Just fill concrete out side the end walls & forget. Concrete footings are required to support each load bearing point of the base frame. Looking for Foundationless Weighbridges ?